Based in Los Angeles, KIIS-FM — OMG, Ryan Seacrest, he hosts the talent show American Idol, too! — is a pop culture powerhouse that unabashedly plays a loop of hit songs its teenage listeners want to hear, over and again. This summer, as I know well, what with three teens in the house (disclaimer: the oldest turned 20 in April), one of those songs is Nicki Minaj’s “Anaconda.” If you are not in the know, let us just say that “Anaconda” is salacious. My 15-year-old daughter, who is a straight-A student and gives her parents zero problems, knows all the words. These include rhymes and riffs that veer from Eiffel to Nyquil to others that are for sure not printable in a family newspaper. The video, with Minaj and a posse of backup dancers twerking and then twerking some more, makes the whole thing all too clear. When I was 15, Karen Carpenter was making big hits. The International Olympic Commitee — indeed, the entire Olympic movement — is trying to figure out how to reach the emerging demographic that is teenagers and 20-somethings. There are two universal languages spoken around the world. To be candid, the notion of an Olympic TV channel is an idea that should have come to fruition already. Like many things in our world, however, this is one of those that is a matter of timing. Five years ago, the idea of such a channel was floated by Comcast and the U.S. Olympic Committee but then abandoned weeks later when the IOC and NBC demurred. Now, Comcast has acquired NBC, and Comcast chief executive Brian Roberts — who, it should be said, was supportive of the 2009 concept — recently played a key role in the $7.65 billion deal that gives NBC the U.S. rights to the Olympics through 2032. Now, Thomas Bach is the IOC president instead of Jacques Rogge, and Bach has signaled unequivocally that the idea of an Olympic channel is a priority. Indeed, of all the working groups in his “Agenda 2020” review and potential reform plan, the channel is the one working group that Bach himself is chairing. The Agenda 2020 process is working toward an all-members session in Monaco in December. There, the channel — along with other items on the agenda — will come up for review. It’s not a foregone conclusion that the members will approve the channel. Nothing in the IOC is ever such a thing. But if ever the timing is right — it’s right, right now. 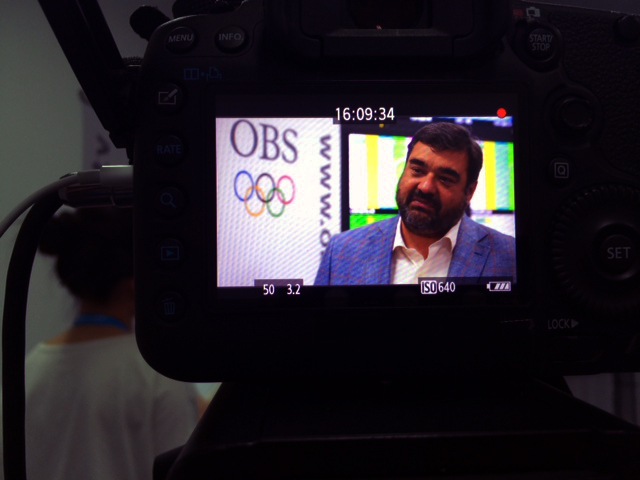 “You mention the example from five years ago and the example from the United States,” said Yiannis Exarchos, the chief executive officer of Olympic Broadcasting Services. “In the last five years, we have seen changes from a century. Timo Lumme, the managing director of IOC TV and marketing services, added, “An Olympic channel is not going to solve everything at a stroke. But what it does is put a marker down and put a destination down for what we stand for. Since early indications are the channel is not about rights fees, there isn’t likely to be a problem with NBC, the BBC, CBC, CCTV or others. Also, it is going to be— by design — a global entity. NBC, just to pick one, serves the terrestrial interests of U.S. viewers, and is in business to make money. The point of the channel is very different. It’s to enhance the Olympic brand — to make it a 365-day-a-year proposition. If done right, the channel not only could but should boost the quality and level of corporate partnerships, potentially meaning revenue over the longer term. But that is not the outset goal. What is, is telling the Olympic story, Exarchos said: the thousands of hours of sporting excellence already on file in the archives along with promoting the values of friendship, excellence and respect; adopting healthier lifestyles; organizing community events in a sustainable way; social inclusiveness; and more. Assuming the members give the go-ahead in December, the channel is likely to get up and running as early as 2015. Back to Nicki Minaj, and for this reason. At the end of “Anaconda,” she sings about other women she meets in clubs. She is dismissive — I am being gentle here — about these other women. What Minaj creates in her song is a world that teenagers want to be part of. She’s so cool that she shows up on TV with Ellen DeGeneres — host of this year’s Academy Awards, hello selfie shot, which was apparently good enough for the IOC at the Youth Games in Nanjing — and DeGeneres makes a parody video that reduces Minaj to hilarious laughter. Teens aren’t old enough to go to clubs, at least — in many countries — not legally. But they yearn to be part of something bigger, something so intrinsically awesome that they say, I’m in. This is what the Olympic Games are about. This is where the Olympic channel comes in. Because aside from the two weeks every two (or four) years, the movement is very good at ceding the spotlight to the likes of Nicki Minaj. And while she has something to say, the movement does, too. To be obvious, it needs somewhere to say it.